Pierre Yves Petit, aka Yvon, is a name little known outside the world of vintage postcard collectors. Yet his images have become iconic documents of Paris in the early 20th century, and a particular view of that city. Think of them as documents of the Paris before it was fully electrified and earned the moniker “City of Lights.” Yvon’s Paris rarely emerges in the glare of full sunlight but looks through the gauzy half-light of sunrise and the afterglow of sunset. Yvon captures the city’s rivers, cathedral balconies, and alleyways cloaked in fog. The people who run its outdoor book stalls, fish in its rivers, and sweep its parks are just another dark smudge on the scenery, a mute piece of the landscape. "[Yvon] noticed an old, bearded man wearing wooden shoes—sabots—and smoking a pipe. He was one of the many booksellers—bouquinistes—who sold their wares on the quai next to the riverside. Behind him, across the river, accentuated by the light of the afternoon sun, loomed the great Notre Dame de Paris. The photographer wanted to make a photograph but the old man, who was tired, cold, and anxious to return home, would stay only if paid. The photographer agreed, gave him five francs, set up his camera, and made what would become one of the best-known photographs of Paris." Yvon’s Paris is a collection of 75 images of the city between the two world wars taken by Yvon as he endlessly ambled about the city, the ultimate flaneur. Stevens will sign copies of Yvon’s Paris on September 25 at 7pm at Inquiring Minds, 6 Church Street in New Paltz. (845) 255-8300; www.newpaltzbooks.com. 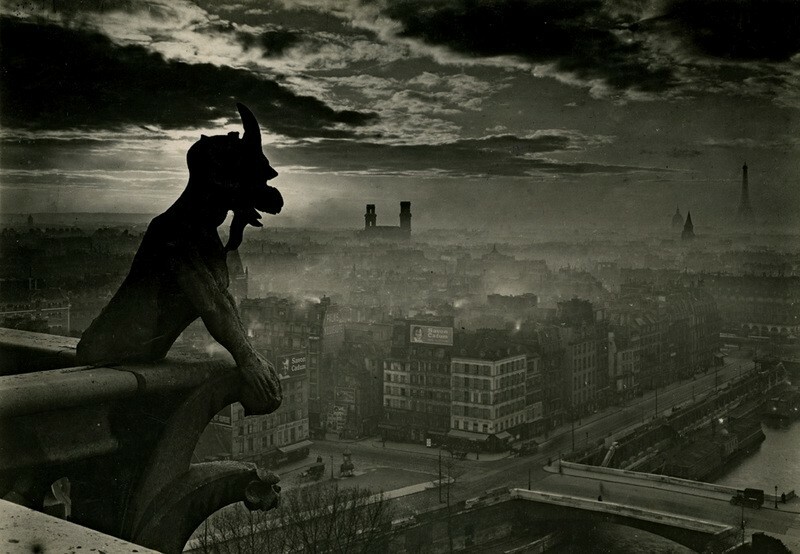 An untitled photograph of a gargoyle atop Notre Dame from Yvon's Paris.